There are still a lot of people leaving webOS. Also maybe some of you want to backup the calendar or import your Palm Profile calendar somewhere (like google). 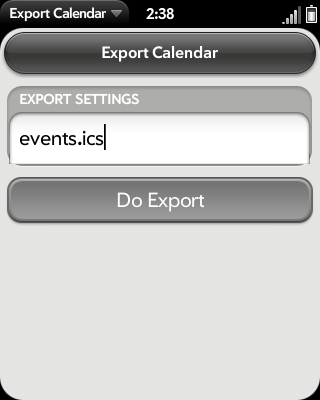 This app will export ALL calendars from your device into one big ics file in the media partition (i.e. USB partition). You will need two patches for it to work. First there is the obligatory permissions patch. You will need to install that and [b]reboot[/b] the device! Otherwise the app will not work and complain about permission problems. Then I strongly recommend you install the Calendar.io patch that fits your device's webOS version. This will make the ics file much more compatible to the standard. That's what you want it you want to import it anywhere in the future. Happy exporting and feel free to report issues in this thread. BTW: To all people that use C+Dav and/or want to support LuneOS development: I plan to use the method of ics creation that is used here for C+Dav in the future, too. So if some of you could test the ics files with their favorite backend servers (maybe in new test accounts ) that would really help me.